Explanation: Driven by the explosion of a massive star, supernova remnant Puppis A is blasting into the surrounding interstellar medium about 7,000 light-years away. At that distance, this remarkable false-colour exploration of its complex expansion is about 180 light-years wide. It is based on the most complete X-ray data set so far from the Chandra and XMM/Newton observations, and infrared data from the Spitzer Space Telescope. 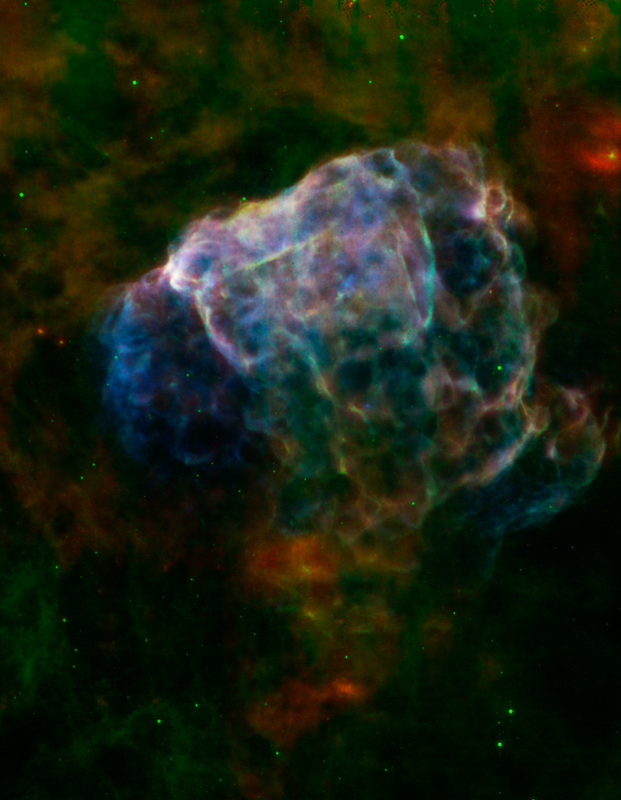 In blue hues, the filamentary X-ray glow is from gas heated by the supernova's shock wave, while the infrared emission shown in red and green is from warm dust. The bright pastel tones trace the regions where shocked gas and warmed dust mingle. Light from the initial supernova itself, triggered by the collapse of the massive star's core, would have reached Earth about 3,700 years ago, though the Puppis A supernova remnant remains a strong source in the X-ray sky.